I joined the Post and Telegraph Department because I wanted a career in radio communications and this Government Department was the only body in New Zealand that offered such an opportunity. Not only that, the P&T Department were offering openings which had good career structures in telecommunications to secondary college leavers. Unfortunately there was no radio establishment, and therefore no positions, in Christchurch, my hometown. The Vocational Guidance Officer in Christchurch, a very knowledgeable fellow, said that P&T Radio would come to Christchurch in a year or so, and I should join as a telephone exchange trainee technician in the meantime. He said that I would start my service and pension scheme early, get experience and receive basic technical training. Then, when radio came, I could transfer to it. This I did. I commenced work as a Junior Mechanician (telephone) in the Christchurch Central Automatic Telephone Exchange on the 15th March 1948. The Ides of March, the anniversary of the assassination of Julius Caesar. That day may not have done him much good but, on reflection, I think it did me quite well, as I ended up with 40 years service in the Department. I was the first of my group that started with me to attend a training school. 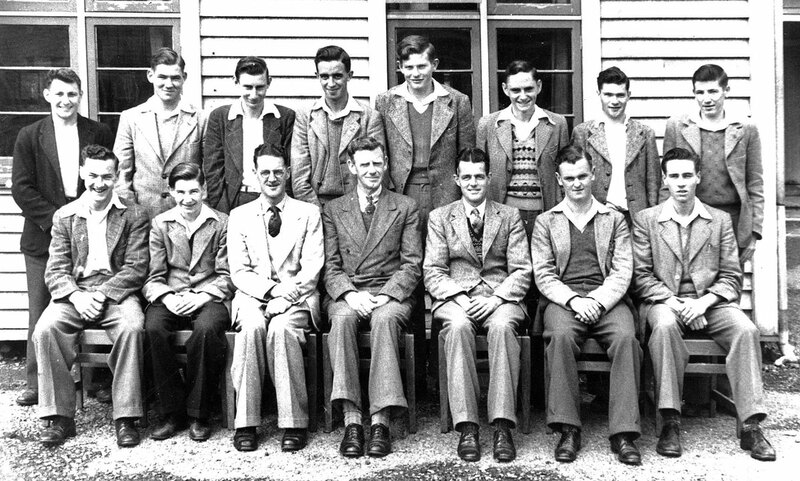 The 14th Telephone Mechanician’s Training School at Trentham, was a 3-month course, starting in January 1949. There were about 12 trainees from around New Zealand at this course. This included two Junior Mechanicians (Radio) from Wellington. 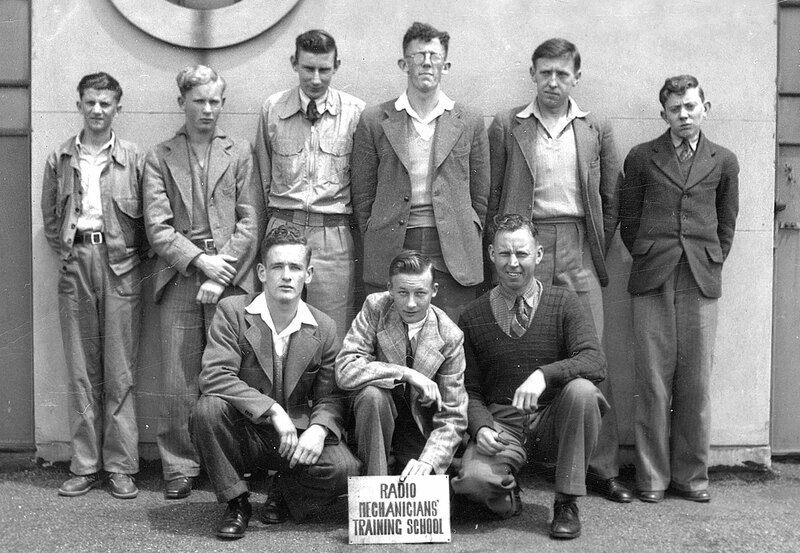 Telephone Mechanicians Training School, Trentham, 1949. Courtesy Bill Heinz (back row, third from left). I did well at this course, which was a mixture of practical (cabling) theory and technical, but I was never shown my report. I did see it years later when I found my District Personnel file unattended on the boss’s desk and sneaked a look at it. My report on that course added that I would be a good candidate for Carrier (transmission) or Radio. On my return to Christchurch I sat my first P&T examination, Introduction to Telephony and Telegraphy. I received news that I had passed this examination, together with the news that I had been transferred, as of 24 August 1949, to the newly formed Christchurch Radio Depot. The Vocational Guidance Officer’s advice had worked well and now I was a Junior Mechanician (Radio). 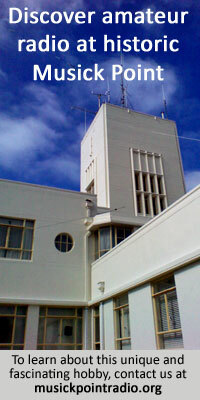 In October 1949 I was nominated for the Radio School to be held at Radio Section, Wellington. There had been Radio Schools held before to train the inrush of recruits during the wartime years of the 1940s (Beechey and Berry). It was a 3-month course held on the second floor front offices. A manual telephone exchange occupied other parts of the second floor. Those from outside Wellington lived at the P&T Accommodation Hostel at Trentham. Radio Mechanicians Training School, P&T Radio Section, Wellington East Post Office, Dec 1949. Rear (L-R): Gosnell, Fuller, Heinz, Rose, Williams, Carran. Front: Snadon (Asst Instructor), Gibbons, Cheshire (Instructor). Courtesy Bill Heinz. Click to enlarge. Perhaps it could be said to be Radio School number one of the last series of schools. Arthur Cheshire was the Instructor with Don Snadon his assistant. I did well at this school, with either Arnold Gibbons or myself topping the weekly exams.